This is the word to describe the amazing season my San Francisco Giants just completed. They are World Series Baseball Champions for the second time in three years. A great accomplishment. For me though this year’s team, and their success, was more satisfying and full of lessons for all of us – sport fans or not. The emphasis this year was on … team. Over and over the players talked about how much they cared for each other and how they focused on what was best for the team. Roles shifted and stars had to adjust for what was best for the team. Several players who professionally hit rock bottom in recent years found salvation on the field. Pablo Sandoval and Barry Zito were pushed aside two years ago when the team won its first championship. This year Pablo won the series MVP and Barry pitched the two best games of his life when the team needed him most. Ryan Vogelsong, one of the starting pitchers for the team, was cut by two separate teams two years ago. He thought he was done with baseball. The Giants gave him a chance and for this World Series … he was an ace and the best pitcher for the team. Each of these players when asked about their accomplishments talked about the team around them. It showed how much they cared for each other and their success was just a part of the team accomplishment. This team faced six separate elimination games. One of the players, Hunter Pence, before the first elimination game brought the team together for one of those sport pep-talks. So often these talks are hollow and desperate. Not this one. By the end of the talk he was a preacher and the congregation was enthralled. The team won that day and the pre-game preacher sessions continued. His message was basic and from the bottom of his heart, “I want one more day with each of you. Play for each other. Win each moment.” In essence he said the magic words, “I love you. We love each other”. These are professional athletes who at the moment-of-truth … saw the truth. We are successful together only as a team, not as individuals. Our ability to care for each other will lead us to the promised land. 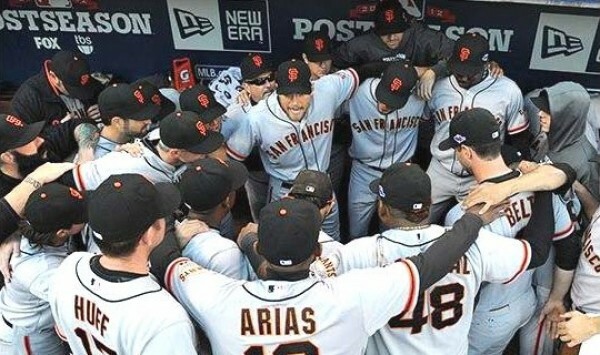 Congrats to the San Francisco Giants, 2012 World Series Champions and a great example of WeMoveTogether. Hunter Pence preaching to the team. Amen, and let’s play some ball! They really are a great example of the sum of the parts being greater than the whole. Thanks Frank – yes, they are and it is fun when a sport team can serve as an example.